The heat is on for the DLT threequel. As much as we love Taco Bell, it pains us to admit we were rather ambivalent to hear about the new Fiery Doritos Locos Taco ($1.39). For one thing, we’ve never had the Flamas Doritos we’re told the shell of this taco is based on. Neither one of your Lunch Bloggers have bought Doritos with any regularity since college, and back then there were only two kinds -- regular Nacho Cheese and the girl flavor, Cool Ranch. Plus, we’re skeptical about any fast food menu items that claim to be spicy, because they never are. 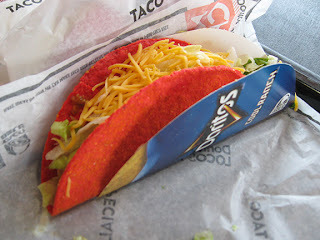 We haven’t even mentioned yet this is the third Doritos Locos Taco the 'Bell has come up with, and threequels always blow.